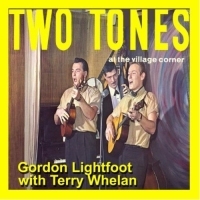 In January, 1962 Gordon Lightfoot recorded a live album, performing with his high school friend Terry Whelan in a duo called the Two Tones. The album, called Two Tones At The Village Corner, was released on two record labels, Chateau and Canatel. Most of the songs are international folk, including standards such as The Fox, Copper Kettle and Kilgarry Mountain, but Lightfoot included one original (This Is My Song), and also a Merle Travis song called Dark As A Dungeon; that's his partner, Terry Whelan, introducing "Gordie". The original song is nothing like those he would be writing and performing a year and a half later, but his vocals on the Travis standard were very much in the "Lightfoot style", and his guitar playing illustrates "Travis style" fingerpicking, which he would go on to use in many of his songs over the next five decades. Note that the recording sounds like "needle drop", meaning that it was recorded off a record, and not off the master tape.